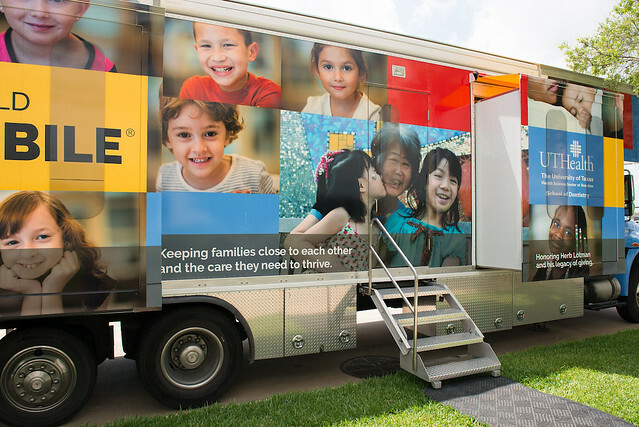 UTHealth School of Dentistry’s Ronald McDonald Care Mobile® has a new look for its fifth anniversary of delivering free dental care for Houston-area children. Five years after launching the Ronald McDonald Care Mobile® — a pediatric dental clinic in a van —representatives of UTHealth School of Dentistry at Houston and Ronald McDonald House Charities of Houston/Galveston Inc. gathered to celebrate a partnership that has provided free dental care worth nearly $600,000 for hundreds of Houston-area children. Since RMHC donated the Ronald McDonald Care Mobile to the School of Dentistry in 2012, the school has used it for clinical and educational community outreach activities, keeping it stocked, staffed and in tip-top condition for regular trips to schools, health fairs and special events. Additional support from Communities in Schools-Houston, CHRISTUS Foundation for HealthCare, Cristo Rey Jesuit College Preparatory School-Houston and other groups makes it possible for the School of Dentistry to treat children in need at no charge. Dean John Valenza, DDS, said the partnership has been a perfect fit on many levels. “Our students say their clinical days on the Ronald McDonald Care Mobile are among their best experiences because of the things they learn, not just about dentistry, but about life, about people and what it means to be part of a community,” he said. Mary Redmond, president of the Ronald McDonald House Charities of Greater Houston/Galveston, Inc. Board of Directors, noted that over the past five years, the Ronald McDonald Care Mobile has logged nearly 10,000 patient visits and provided X-rays, cleanings, restorations, extractions and other dental services worth more than $100,000 per year.